Fix or replace faulty door closers. Prevent carbon monoxide poisoning by making sure that the door leading from the house to an attached garage has a door closer strong enough the close the door all the way till it is latched. Don't be fooled if it looks like the door is completely closed. The best way to test the door closure is by pushing against the "closed" door. If it opens use the adjusting screw(s) to increase the tension or if this doesn't work replace the door closer immediately. Get the right door closer. Some are for LH or RH doors while others are reversible and can be used for either application. There are industrial and automatic door closers in public places as well as door closers for residential use. I will briefly discuss the latter as they may be of interest to the homeowner. The door closer stores the energy used in the opening of the door in a compression or torsion spring and releases it to close the door. 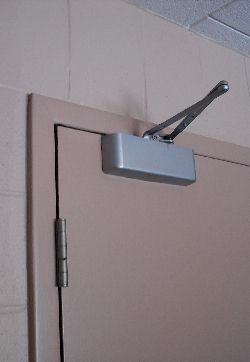 Some closers allow for adjustment of the strength of the spring, making it easier or more difficult to push the door open. To limit the speed at which the door closes, most door closers use hydraulic (oil-filled) dampers, although spring mechanisms may also be used for controlling the speed at which the door closes. Depending on the make and type of door closer there may be one or more adjusting screws to control the time it takes to close the door completely. Some closers are set up in such a way that the doors closes fast for most of the way and than provide extra torque to engage the latch. The closing speed can also be adjusted if more than the usual time is required to clear the doorway. Door closers are required for all doors that are considered to be fire doors as well as for doors that lead from the house to an attached garage. During my years inspecting homes more often than not I found that the man door, the one from the house to the garage, had been disengaged or even completely removed. Over and over I heard excuses like "It is easier to have the door stay open when I have to make several trips to bring in the groceries" or "The door doesn't closed all the way so I disconnected the closer till I have it fixed" and "The door opener broke down and I haven't had time to call someone who can fix it". They may be all "good" reasons but not having a proper operating door closer on your garage door could lead to disaster. Building codes require a door closer on interior garage doors to be in good working condition to prevent carbon monoxide from entering the house.